It's amazing to me how things just fall into place! We recently got two new beautiful framed photographs to update some spaces in our home and I'm totally in love with them. The new photos came at the perfect time as we had just gotten rid of our TV and cable. We were searching for the right piece to go on the large wall in our living area and one to go in Jack's bedroom. The best part? Both photos are shot by Gray Malin. If you aren't familiar with his work, you should be. The positive, carefree and bright elements are so timeless, yet fresh. I love the unexpected twists and creativity as well. It’s just so inspiring and wonderful all around. Gray is so kind himself and it really shows through in his art. The elephant print has several special meanings for us, which is why we love it so much. My in-laws used to have quite a collection of elephant icons in their home. I visited several elephant sanctuaries in Thailand and when JC and I were in South Africa, we spotted several elephants, including babies. They are such fascinating and lovely animals. Also, serendipitously, I happen to be at The Parker when this photo shoot was happening. In fact several friends and I walked up right when Eliza was being walked through the path after she was done with this shot. We saw the balloons and Gray was kind enough to talk with us and even pose for a photo! We love seeing Gray Malin's work throughout our travels as well. In Bermuda, a friend and I immediately spotted his work in a resort shop. The owner told us the pieces were actually shot right there. When we were in London last year, we stayed at Le Meridien in Piccadilly and spotted several of his pieces there. I love that there are so many great collaborations so we can infuse more of the style and vibes into our lives as well. More happiness and fun, and more Gray Malin - that’s what the world needs. If you'd like to read more about the photoshoot and how these images came to be, you can take a look at this post on Gray Malin's blog. 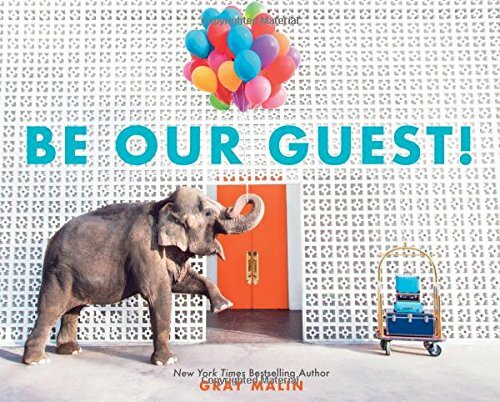 And last but not least, Jack is obsessed with Gray's newest book, Be Our Guest!